Les 15 et 16 Novembre 2018, le Pr. 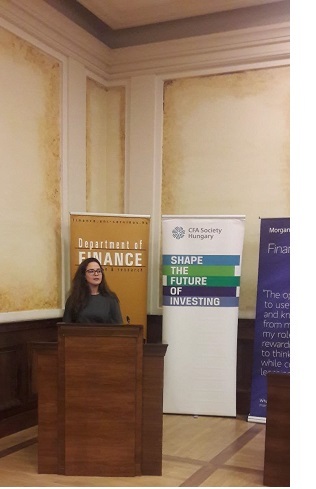 Selma Haj Khlifa a participé à la la « 9th Annual Financial Market Liquidity Conference », organisée par le Centre de Recherche Financière-Département de la Finance, de Corvinus Business School à Budapest et le Groupe de recherche sur la théorie des jeux, Centre d’études économiques et régionales de l’Académie Hongroise des Sciences. « This paper aims to discuss the economic impact of the Internal Rating Based (Basel III) reforms on financial economic growth. The easing of the Basel Committee’s definition of liquidity coverage ratio is not only good news for banks, it is, more generally, a relief for all companies. Signed in 2010 and gradually phased in from 2015, the Basel III agreements introduced new solvency and liquidity ratios for banks. Under the Basel guidelines, the Basel II and Basel III Regulatory Framework requires regulators to ensure that banks implement compliant credit risk rating approaches that represent their internal risk profile. Following the financial crisis of 2007, the main question remains unanswered : is the internal ratings-based “IRB” approach the solution or the cause of the problem? In fact, the problem of access to financing called for the study of criteria that may influence the granting of bank loans, knowing that these businesses depend heavily on them. Despite their vital role in the economy, the companies still struggle to obtain bank financing. Since the 2007-2009 financial crisis, regulatory capital requirements combined with the sharp deterioration of the quality of bank assets have reduced the ability of various credit institutions to finance relatively risky projects, large companies, small and medium-sized enterprises (SMEs) and innovative start-ups. Basel III accord is the third set of reforms established by the Basel Committee, after the Basel II and Basel I agreements. Since 1988, the Basel Committee has instituted a so-called « Cooke » ratio which required a level of equity capital from banks above 8% of total weighted assets. In 2005, this ratio was replaced by a new « Basel II » accord that offers a more complete coverage of banking risks and refines the methods for calculating regulatory capital. Starting in 2010, the Basel Committee introduced a new reform « Basel III », in response to the financial crisis, which calls for a strengthening of the level and quality of banks’ capital. In this regard, several impact studies of internal rating approaches ‘IRB’ on the European banking sector have been established and all point to a substantial increase in banks’ regulatory capital. According to a study published by McKinsey & Company (2010) 1, European banks are expected to mobilize nearly 700 billion euros to comply with the single standard established by the capital adequacy ratio (Core Tier 1 and Tier 1) of which € 200 billion concerns the top 16 European banking groups. In 2011, the Institute of International Finance, representing the global financial industry, estimates the cost of switching to Basel III reform to about $ 13 trillion. risk-weighted capital levels is likely to dampen economic recovery. As part of the reform process, the implementation of internal rating approaches “IRB” under Basel III will result in a significant increase in banks’ capital requirements which will have an impact on the distribution of credit to nonfinancial institutions and on economic growth. Empirically, our contribution will cover the long-term implications of the guarantee schemes granted by the state to support the financial sector. It will particularly assess the changes in institutional behavior that lead to the rationalization of the financial sector under the Basel III guidelines. Large Business and Small and Medium Enterprise, Basel Committee, Internal Rating Approaches “IRB”, Credit risk, Institutional guarantee, Economic growth.